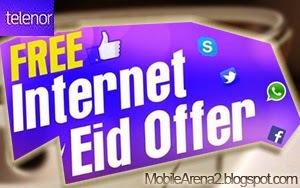 Enjoy Absolute Free 2G and 3G internet for three Eid days. This Eid, Telenor giving you Eidi is a wonderful style. It offering you free of cost internet for all three days of Eid. You can now feel free to wish your friends and family around the world by using social media. Upload your photos from the Eid festivities straight from your mobile phone at no cost. The offer is valid from Chand Raat and all three days of Eid, with 100MB Per day provided FREE on both 2G and 3G Internet. Dial *345*132# to avail this offer. Remember that once you dial this code, it will provide you Free internet for one day. Next day you will have to dial this code again to avail full day Free internet. There is no activation Charges of this offer. This offer is available for both 2G and 3G users.